A pensioner was on Thursday found hanging from a rope in an Alness Village, Corentyne mandir, for which he had been the caretaker. 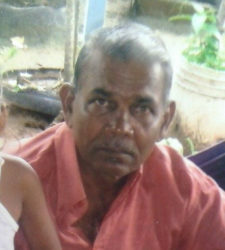 According to relatives, Jamoona Somai, 63, was ill, which they suspect may have led him to end his life. A post-mortem examination carried out yesterday revealed that Somai died of strangulation. His granddaughter, Drophathi Bharrat, 18, who has been living with Somai and his wife, discovered the body hanging in the mandir, two lots away from their home around 7 am. “When me go, the mandir gate open and the side gate open and from the gate me a call for him and he na answer. Me na go pon the door, me open the front window and when me open the front window me see him,” Bharrat recounted. She then raised an alarm, after which relatives and neighbours flocked. Somai’s daughter, Savitrie Leonard, explained that her father suffered two strokes and a heart attack last year. Leonard stated that her father had not been the same since. She disclosed that he would sit by himself in a corner and when they would question him, he would always complain of pain in his stomach. “He always does say, ‘Why he got to sick?” Leonard said. When this newspaper visited, Somai’s wife, Khemwattee, sat in her hammock, with tears flowing from eyes. “My husband is a very good, quiet man. He takes care of the mandir. He loves all of his family and neighbours,” she said. Somai is also survived by his four children and grandchildren. Guyana has been ranked as the world’s suicide capital, prompting government to initiate a multi-stakeholder initiative to address the problem.